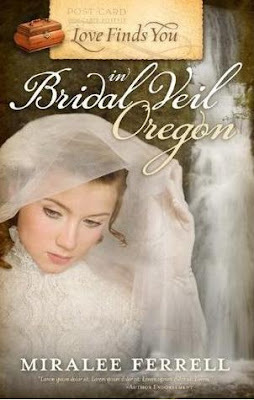 I was pleasantly surprised with the latest book CFBA sent me to review, Love Finds You in Bridal Veil Oregon by Miralee Ferrell. Miralee tells a sweet (but not sappy) story of love and trusting God in all things. Margaret is recovering from a broken heart and beginning to accept the attentions of man #2 (while rejecting creepy #3), when man #1 arrives back in town. Ah, yes. Past miscommunication is revealed, jealousy ensues, tragedy strikes, mystery lurks, and love prevails. But, ‘tis the truth! It’s all in the book – with a little surprise (that I’d wondered at!) at the ending! Margaret was a character I could easily relate to. Oh, no, I haven’t had jealousy ensue over me, but her struggle to trust God in all circumstances is something I think we all can understand! How often do we do what we think God says?? Or what we feel God told us?? Hmm… better check it with God’s Word! They are always in agreement. Always. Margaret hurried to the two-story house set against the base of the tree-clad hill, anxiety dogging her steps. Papa had been tired when he’d left the house early this morning, but he’d been working at the mill long hours of late. Nothing to worry about, he’d assured her— he just needed the Sabbath to catch up on his rest, and he’d be right as rain. But she didn’t believe it. He looked peaked and moved as though weights were attached to his limbs. Best to keep an eye on him, in case he was coming down with the grippe. “Papa? You home yet?” She flung off her sweater and dumped her books on a nearby table. She’d not meant to stay so long at the school, but little Mark James had thrown one of his temper tan¬trums and needed a talking to. Then the chores had to be done— the floor swept, the board erased, her desk straightened—all things that didn’t normally take much time, but Gertrude Graham had stopped by on her way home from the Company store and slowed her down further. Gertrude was a sweetie, but everyone in town knew her propensity for gossip ran as deep as the nearby Columbia River. Margaret had at last made her excuses and headed home. Part of her hoped Papa had kept his promise to leave work early and rest, while the other part wanted to light the stove and get supper going before he arrived. Dusk wouldn’t settle in for another hour or so, but she lit one lamp just the same, wanting a cheerful glow to penetrate the gloom when he made his way down the trail. An hour later she glanced out the window again, hoping to see his familiar figure trudging up the path. Nothing. She dusted the flour from her hands and finished mixing the dough for the chicken and dumplings, then dropped globs of dough onto the steaming mix¬ture in the pan and covered the large cast-iron skillet with a domed lid. At least the house was warm. In a few minutes the dumplings would rise, filling the room with their fragrance. Her mouth watered at the thought, and her lips tipped up at the happiness that would light Papa’s eyes when he stepped through the door. Just then the front door rattled, and her hand flew to her throat. Papa wouldn’t shake the door handle or knock; he’d stride in with his booming greeting and big smile. Margaret stood in the middle of the kitchen frozen by uncertainty—but only for a moment. Could it be a neighbor in need of help or one of the unsavory characters riding the railroad cars of late? Hobos had been increasing in number, and her father had warned her not to open the door to a stranger if he wasn’t home. She reached for the heavy wooden rolling pin resting on the painted countertop Papa had built and gripped it tight. “Who’s there?” She took a step toward the door in the nearby living room. No reply. The knob moved again but this time with less energy. What in the world? She gripped her makeshift weapon tighter and crept to the door. A quick twist of the round metal knob and a jerk of the door brought her face-to-face with Papa slumped against the doorjamb, his head lolled to the side. Margaret dropped the pin, and it clattered to the floor. She grasped his shoulders and gave him a small shake. “Papa? Are you sick? Papa!” She ran her gaze over his body, trying to find any sign of what might be wrong. She slipped her arm around his waist and tried to support his sagging weight, stumbling as his feet barely cleared the threshold. Somehow she managed to half carry, half drag him to the worn couch against a nearby wall. He settled down with a groan and started to shake. Beads of sweat popped out on his forehead, and his breath came in shallow gasps. Margaret leaned over her prone father and clutched his hand, willing her own to stop trembling. “No. Don’t talk, just rest. You’ll be fine.” She bit her lip, wanting to race down the path to the doctor’s home a quarter mile away but was terrified to leave him alone. Instead she lifted the knitted afghan off the back of the couch, spread it over his shaking form, and smoothed back his hair. The black hair flopped on his forehead as he nodded in assent. “Yes, ma’am.” A flick of his wrist tossed the pole into the nearby brush and the boy was off, racing along the path on the shortcut back to¬ward town. “No. Shouldn’t have done it,” he panted. “Tried. To fix it. Forgive me.” The words trailed off, but his imploring eyes didn’t leave her face. A deep sigh escaped, and his eyes closed again. Margaret grasped his hand tighter and prayed. God couldn’t let her father die. She wouldn’t allow it. Mama had died twelve years ago, and her grand¬father just last year. Between that and losing Nathaniel… That was enough for one person to bear. Papa had the grippe. He’d be back on his feet soon, laughing and teasing about her temper matching her auburn hair and living up to Mama’s Irish heritage. That moment her father’s body convulsed. The muscles around his mouth tightened, then suddenly relaxed, and the already weak fingers grew limp in her hand. He lay still with not even a twitch of his eyelids. Panic sucked the breath from Margaret’s lungs, leaving her dizzy and faint. She shook her head, drew a deep breath, and forced the reaction away. No time for foolishness. Papa needed her strong. She drew close to his face, praying for movement, hoping for another breath. “Papa. You can’t leave me alone.” Asob tore at her throat and slipped out in spite of her effort to quell it. “I need you, Papa. Please, please stay with me.” She lifted a shaking hand and patted his cheek, hoping and praying he’d respond. All of a sudden, realization struck her with its deadly truth, and she moaned. Frantically she searched for some sign of life—breath¬ing—a flicker of his eyelids. But there was nothing. Papa was gone. He’d never smile or tease her again. Never enjoy the meal she’d pre¬pared or sit in a church pew beside her on Sunday mornings. How could she stand it? What would she do now? Oh, why had God seen fit to take him when he was still young and she had no one else in her life? She dropped her head on his shoulder and sobs welled up from a place so deep, a place terrified of the pain and lone¬liness she knew would come. Just like it had with Mother. Just like it had with Grandpa. And just like it had with Nathaniel. No. She’d not wallow in that now. A knock sounded at the door, and the knob turned. She only vaguely felt gentle hands stroking her hair and a strong arm wrapping around her shoulders, drawing her away from the still figure on the couch. Many thanks to Miralee, through Summerside Press and CFBA, for giving me the opportunity to read and review her book! Sounds really good. Will you be doing a give away of your copy on your blog? Thank you for spotlighting my new release and for your wonderful review. I'm so glad you enjoyed reading Bridal Veil! A WINNER and a Chocolate Ice Cream Recipe! COOKWARE.com and Deni Ice Cream Maker Giveaway!